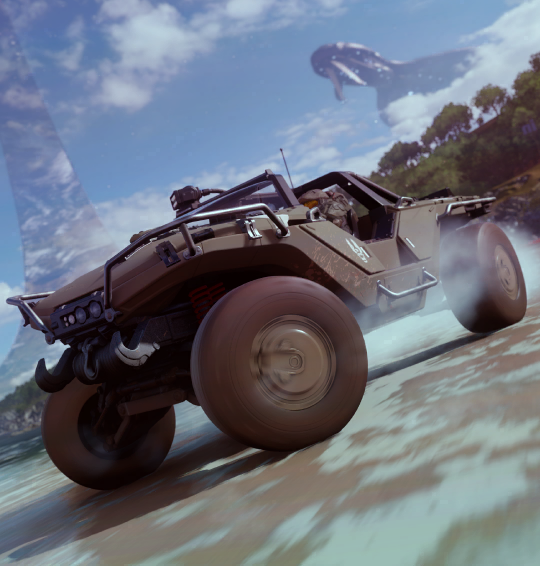 Forza Horizon 4 could soon be welcoming a famous Halo vehicle back into the fold when it launches later this year. Thanks to a set of leaked screenshots that popped up on Reddit by way of user DusenberryPie, we got our first look at a special showcase event that appears to include Halo's iconic Warthog. Also making appearances are a Covenant ship and a Halo ring stretching into the distance. It's unclear what type of mission this will coincide with, or the event's theme, but given footage recorded by YouTuber GokuYourself, it's likely it could be some sort of nod to the Halo mission "The Silent Cartographer," the famous fourth level from the original Halo: Combat Evolved that stretched along a scenic beach with optional vehicle segments. There's a special icon in the footage that looks just like a Pelican on the map you can see in the video, and it's located on the eastern coast. This won't be the first time the Warthog has appeared in the Forza Horizon series either. It was previously unlockable in Forza Horizon 3 as part of a challenge that heavily featured Halo 5's sweeping soundtrack. After completing the mission, it was up for grabs in the game to be used just like any other regular, not-outer-space vehicle. Hopefully we'll find out more about the supposed Halo event ahead of Forza Horizon 4's Oct. 2 release date on Xbox One and PC.